Waning Moon – 11.30pm, Weather clear. 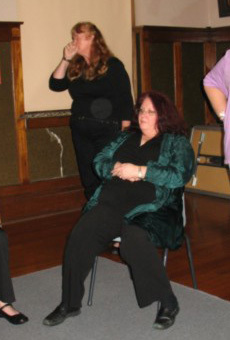 The energy in the lounge was quite oppressive. It was also quite unnerving having a constant sense of being watched. In the main hall I had the feeling of a presence standing behind me and a distinct sense that we weren’t welcome there. While we were investigating I did feel movement and notice shifts in light (even though the lights were out the environment seemed to darken and then lighten). At times I felt coolness on my body and what seemed to be a dark shadow moving about. This all mainly happened in the hall upstairs. I didn’t really get anything downstairs at all, it felt quite calm to me. I felt very uncomfortable in the small area leading to the 2 office rooms upstairs and at one point when I walked into this area one of the doors rattled. I tried to manipulate the area to see if it was me walking in that did it but I couldn’t seem to replicate what caused it and there was definitely no breeze present to have caused it either (unless of course one of the windows inside the room was open but I can tell you that they have always been closed when I have been there). So, who knows!! 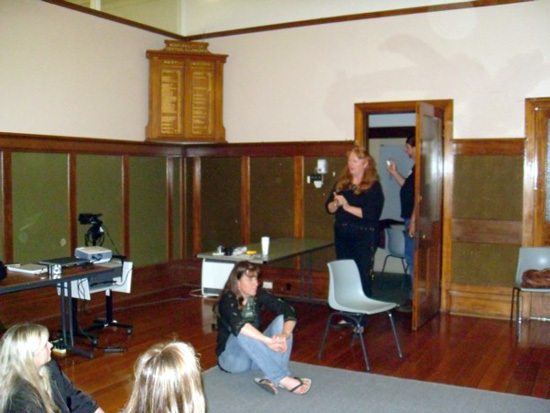 Last night at Bulli Community Centre was a rather interesting experience. While I didn’t actually see any spirits as such I did get a very strong impression of a little girl in the hall, which was substantiated by other people on the night. I was first aware of her when we approached the hall – I had the feeling she was looking out from an upstairs window, and was not very happy. I “saw” her as being around 8 to 10 years old, with long dark brown hair neatly parted in the middle and tied in pigtails. She was wearing a white/cream party dress which had a a fitted bodice, puffed sleeves and a gathered skirt which came just below her knees. She wore white/cream shoes with white roll-over socks with lace edging. Her pigtails were tied with pale lilac/mauve ribbons and the dress had a matching ribbon around the waist, tied in a bow at the back – I got the feeling it was the 1950’s. When we were inside the hall I “saw” her mostly from the back view, as she was leaning on the windowsill looking out across the road, very sad and/or bored with whatever else was going on around her. 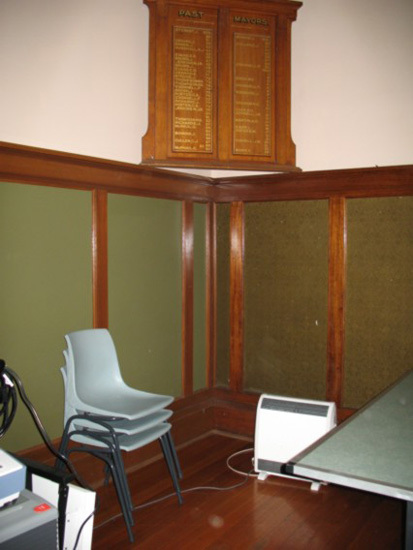 I also detected a few sources of energy with my dowsing rods, both upstairs and downstairs in the building, which coincided with places that other people had independently sensed things as well – either with physical reactions, or with dowsing rods, pendulums or electronic equipment. 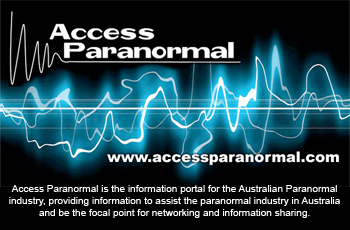 We were all very aware of sudden temperature changes and a feeling of “movement” of shadows or entities around us, as well as a sense of heaviness or oppressive energy and the feeling of being watched. Moon Waxing near full – 10.30pm Moon in Aquarius, Weather – clear, Temperature 17 degrees, Geomagnetic field was quiet. 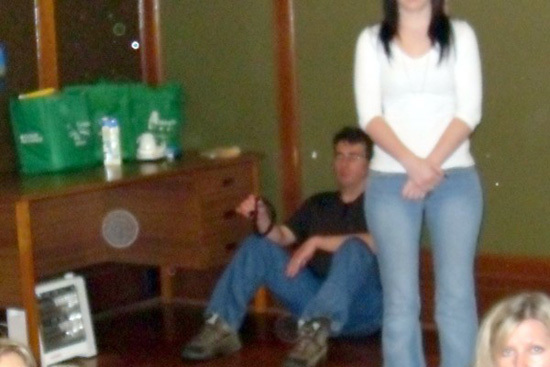 During the Ostara ritual I noticed on two occasions a presence in the corner of the hall observing. 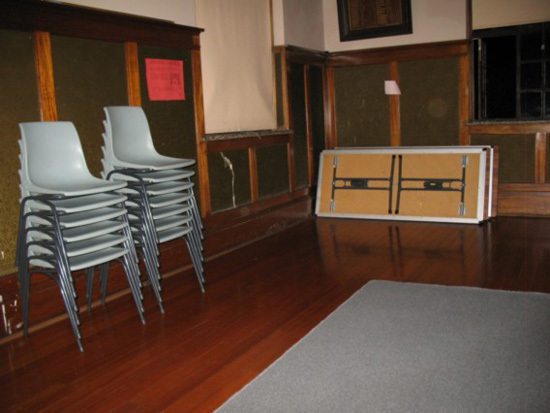 When the investigation was commencing using the pendulum I ascertained that there were active spirits in the building but they wanted to be left alone. The investigation had a different feel from the last investigation, the first had an oppressive sense about it but this one felt quite empty. 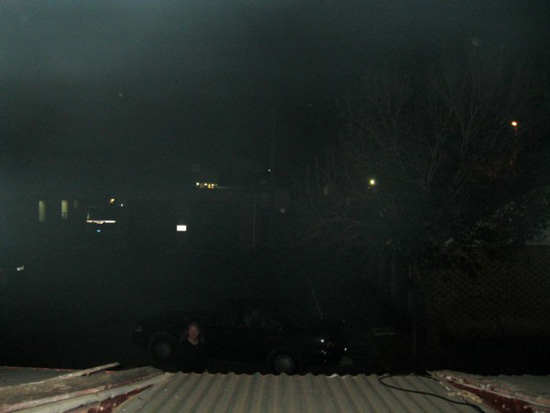 Orbs in the mist – it was a clear night and no mist was visible to the naked eye. This photo was taken shortly after the previous one. Never having been there before I wasn’t sure what to expect. I noticed people saying it felt different than it had before? I was immediately drawn to the upstairs hall between the offices, particularly wanting to go into the office on the left. The air in that area felt dense. I very much felt a masculine energy that I don’t feel is grounded (as the energy eventually subsided) or maybe it went into hiding? The hall felt very different from last time, it was very quiet and felt very empty. I only got vague impressions of something and not overly strong, unlike last time. Photo taken just after we finished meditating, and before the lights were turned on. There are three orbs, but nothing overly distinct. 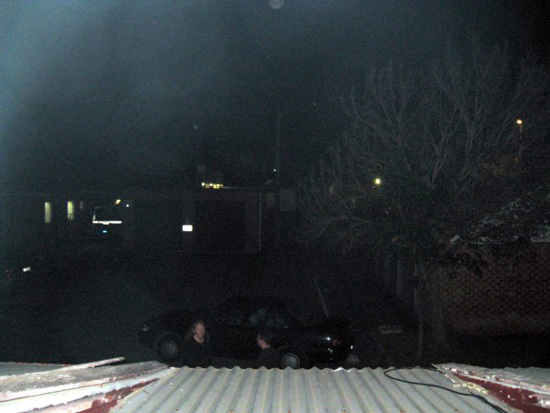 There are two overlapping orbs at the bottom of the picture, in the middle. 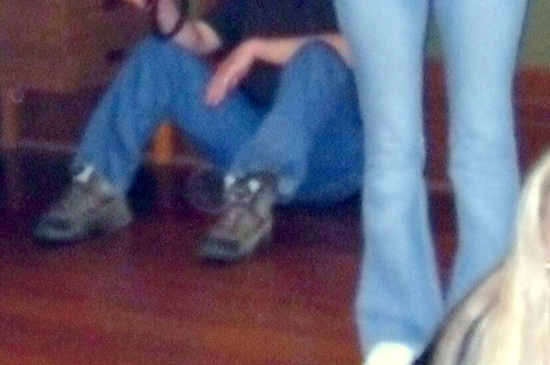 Photo enhanced to show orb more clearly. I also noticed the empty feeling in contrast to last time we visited the centre. However, at one stage I “saw” in my mind a man standing in the doorway of the lounge area, watching us. As everyone else at the time said they didn’t sense anything I just assumed it was my overactive imagination and didn’t mention him. Later in the evening, Amethyst started describing a man she could now “see” – her description, including his hair colour, matched very closely to the man I thought I imagined. Then today, while researching online the history of the building for this article I came across some early photographs of the Bulli Shire Council …and there he was! Hmmm… coincidence? …imagination? Definitely intriguing! We meditated by candlelight while trying to “tap in” to any spirits present. This was when I got the impression of the man mentioned above. 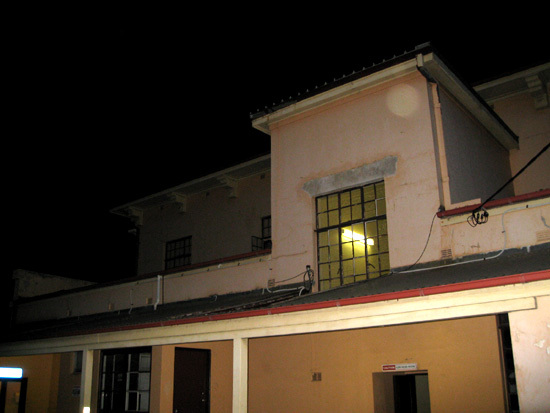 I didn’t capture any orbs or other anomalies on camera inside, so I went outside the building. Only one large orb near the top – it may or may not be anything special. 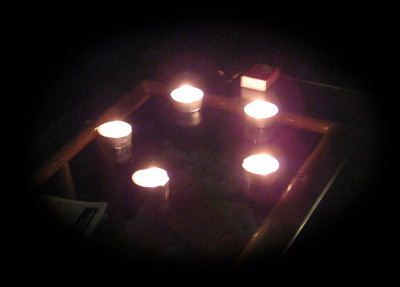 The team’s focus could have been distracted from the purpose of the investigation due to the energy of the ritual.